Note: there are still a few spots open in next week's public workshop in San Francisco! Details and registration can be found here. Speaking of workshops, one of my favorite parts about teaching in this space is the exposure I get to a ton of diverse and interesting real-world examples. When working with an organization, I typically collect examples from them to understand how they are currently communicating with data. This is a great lens into the team and their work and it helps me customize the workshop content for the given group. It also forces me to face some of the same data visualization challenges that they are facing and explore potential ideas for how to solve. Note: details and numbers have been modified to protect confidentiality. Let's assume this is a consulting company that submits proposals for potential projects. They are interested in increasing their work in the coming year. They are analyzing their metrics from the past year to help inform how to do this. In particular, they want to better understand the cases where they either aren't submitting proposals or didn't win the work when they did submit the proposal in hopes that this will help them direct future effort and bring in more work. I had a single primary goal in mind when determining another way to show this information: make it clear how the data in the pie and the data in the table are related. In other words, connect the dots for the audience. We likely assume there is some association when we look at these visuals. We see 37 wins in both the pie and the table. 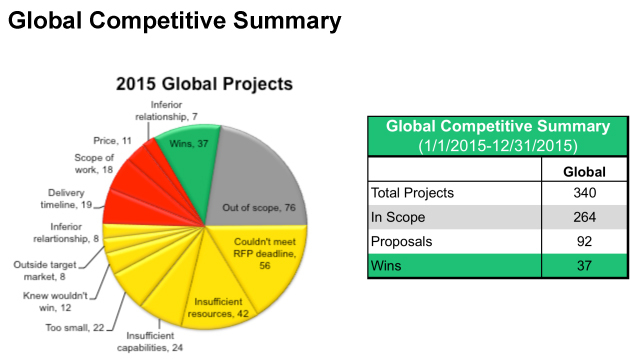 Summing up the pieces in the pie confirms they add up to the same 340 Total Projects shown in the table. But from there, the connections are less clear. It turns out they are directly related: the grey Out of Scope is Total Projects minus In Scope (in the table, 340-264); the yellow segments combined represents those in scope but where no proposal was submitted (in the table, 264-92); the red segments combined are cases where a proposal was submitted, but lost (in the table, 92-37). If we make some assumptions about what the colors in the pie mean and spend enough time doing math, we can perhaps figure this out. But why make an audience go through that? I led with the data that was originally in the table, plotting it via horizontal bars so that we get a visual sense of the relative numbers and don't have to read them. I added and labeled the segments of interest (No proposal submitted, Lost), showing visually how these relate to the other data. The dotted lines help give a sense of opportunity lost. Each of these are further broken down on the right-hand side and connected visually through consistent use of color. I was more descriptive in my titles throughout, also in an attempt to make the associations between the different parts of the data clear. I replaced the descriptive headline (originally "Global Competitive Summary") with one potential takeaway from the data. This is a good first step. When it comes to telling the story, there is certainly more we could do either in the voiceover in a live meeting or presentation, or via additional text when it comes to interpreting and driving action based on this data. We could use this as a starting point to tee up a conversation about where we've lost out in the past year and how we can change this going forward to win more work. Bottom line: when showing what could be viewed as disparate data (but isn't! ), connect the dots for your audience! The Excel file with the above before-and-after can be downloaded here.